This important milestone signals the first ever commercially scheduled A380 service to Vienna International Airport. Emirates has been flying to Austria since May 2004. On the flight deck of last night’s A380 flight to Vienna were Captain Ali Kashwani and Austrian born First Officer Markus Ausserhofer. Over 600 plane spotters and spectators gathered around the edges of the airport to witness the giant aircraft touchdown in Vienna. Speaking at an official reception held at Vienna International Airport, Thierry Aucoc, Senior Vice President Commercial Operations for Europe and the Russian Federation said, “Emirates has developed its operations over the last ten years to Austria. We’ve worked closely with trade and industry partners to gradually increase services based on tangible market demand. Emirates is proud to contribute to attracting trade and investment into Austria, and we will continue to support the country’s multi-billion Euro tourism sector by promoting Austria as a destination and drawing in visitors from a host of points across the globe. Emirates is proud to serve other European capital cities like London, Paris, Rome and Amsterdam with our iconic A380 and we hope that one day we will be able to bring the flagship to Vienna.” Last year, the number of visitors from the UAE to Austria grew to over 70,000, an increase of over 14per cent. Tourism is the Austria’s biggest foreign exchange earner and the fastest growing sector. Over 220,000 people in 40,000 tourist establishments generate 10per cent of Austria’s economic output, according to the Austrian Tourism Board. Norbert Kettner, Director of Vienna Tourism said, “For many years, Middle Eastern and Asian markets have been instrumental to Vienna’s tourism growth. Between 2003 and 2013, overnight stays for Middle Eastern visitors grew at an exponential rate of almost 359per cent, increasing to 277,000 room nights. 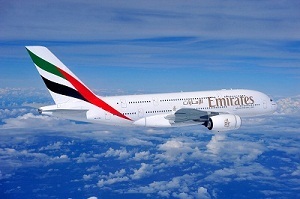 Emirates has been an important contributor to the tourism growth of Vienna. The upgrade of its frequencies within the last ten years from 4 to 13 flights per week is a direct reflection of this development, which is good news for Vienna.” Julian Jager, COO of Vienna Airport said, “The visit of an Emirates A380 aircraft for a regularly scheduled flight is a highlight for Vienna Airport. We see this as recognition of good cooperation which has existed over the past ten years. We are very pleased and will continue to grow this partnership in the future.” Guests invited to a special reception at Vienna International Airport were given the chance to explore Emirates’ flagship A380 aircraft – with its 427 seats in Economy Class, 76 lie-flat beds in Business Class and 14 First Class Private Suites, and unique Onboard Lounge and Shower Spas.